Soldiers based in Essex have had the repercussions of dangerous driving spelt out to them as part of an event organised by the county’s Fire and Rescue service. More than 300 troops from the Colchester Garrison took part, and heard why they fall into a high-risk category when driving – particularly when returning from a tour of duty. Essex County Fire and Rescue road safety team members were joined at Merville Barracks by colleagues from the FireBike motorcycle safety initiative, who highlighted the dangers of irresponsible and careless powered two wheeler riding. The attending soldiers watched a road traffic collision extrication demonstration by Wivenhoe and Colchester firefighters, and used virtual reality headsets and ‘drink driving goggles’ in the Fire Service’s Community Wheels vehicle. They were also given the opportunity to talk to the road safety team about any issues they wanted to discuss. “The event was organised to raise road safety awareness to soldiers returning from duty – to give the troops an understanding of what impact their behaviour on the road can have on other road users. “Studies show soldiers fall into a high-risk category when driving – mostly associated with returning from duty abroad and coming back to civilian life thinking they are invincible. 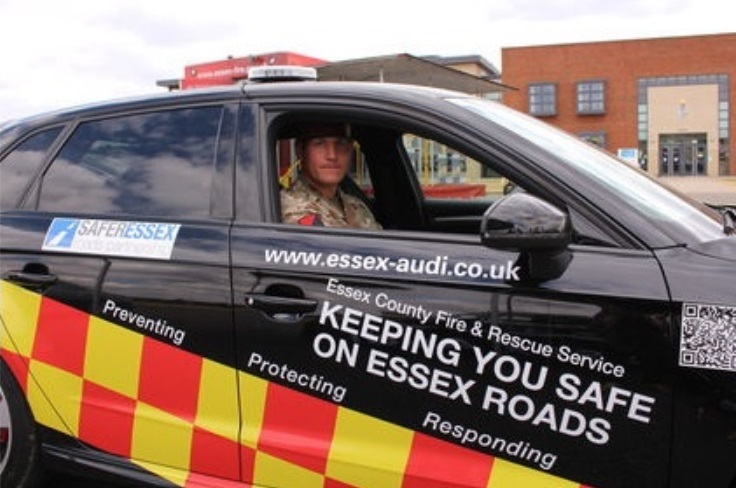 During the event a new Audi S3 FireCar was officially handed over to the Fire Services’ Road Safety Team by Darren Thompson, head of business at Essex Audi. The new FireCar was on display at the barracks to engage the troops and raise their road safety awareness.